Many people find themselves in physical pain, with little or no understanding as to how it came about. The youthful joy, revelry of movement, and freedom in their bodies seems to have faded, leaving only tension, stress, and discomfort. Changing habits can seem an even more daunting task than alleviating the pain. Certain that there must be a path to freer movements, many seek solutions in surgery, pills, and/or simply giving up on their dreams. Nevertheless, according to F.M. Alexander, the creator of this Technique, it is only a matter of inhibiting the habits that create tension, and redirecting our bodies toward fresh movements of ease and expansiveness. The Alexander Technique focuses on two mental practices that can help to guide students along the path of awareness to a clearer understanding of the mind/body connection. Inhibition, the first and most important part of the Alexander Technique, is the name F.M. Alexander gave to using thoughts as an interruption of habitual movement. Teaching us how our postural patterns create constriction and collapse. Using the principles of the technique, we can inhibit stressful patterns and replace them with greater ease and pleasure in the body. When an adult thinks about movement of any kind, he or she immediately engages the muscles needed to fulfill the motion. Often, it becomes very difficult, then, for adults to change their movement patterns because the very thought of the motion has already initiated tensions they are trying to undo. However, using inhibitory mental phrases such as “I am not singing” or “I am not walking,” Alexander found that it is possible to interrupt the thought, release the tensions, and keep them from recurring. He also noted that while inhibition frees the mind from tension-creating whirlwinds and provides an opportunity to make conscious choices, that the choice itself must also be noted. This, he called Direction. The “direction” as Alexander described it, is a collaborative effort of observations, awareness, and focus concerning the nature of free and natural movement. As much as we can inhibit habitual tendencies, we can also provide for ourselves a more beneficial path to take. By implementing Inhibition and Direction, we find that our bodies instinctively take on a new quality – a quality not of routine action, but of better movement. With this our heads can rest freely atop our spines and our bodies can experience movement with ease and efficiency. Such is the power of the inhibiting thought, coupled with the ability to intend, or direct, movements. Imagine all of your body being fluid and free – initiating movement from a new and comfortable place! Imagine applying these techniques to exercise, sports, resting, dancing, and singing! Studying this technique, and the way the mind and body interact, has been Janice’s passion for over 40 years. Her self-created and progressive teaching methodology, which she calls “Body Dialogue,” incorporates insights and teachings from The Alexander Technique, and helpful mind/body techniques from the more conventional approaches of yoga, dance, and voice. 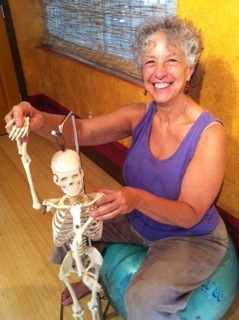 Janice helps her students to identify where they hold tension, assists them in discovering new movements while inhibiting old patterns, and reminds them to “Inhibit and Direct.” Over the years, Janice has guided thousands of students to greater bodily freedom – helping them to discover their own movement habits while learning to move with ease, poise and joy. Looking back on that morning in New York City, she recalls the pain as a strange, distant memory. It is a testament to how far she has come through dedication and perseverance, and an inspiring new option for the many potential students convinced that there must be a better way to exist – a freer way to move.